So, you’ve had your beautiful baby, you are settling into a routine and have chosen to breastfeed your child. If you’re not intending to get pregnant again sometime the coming months what are you going to do about preventing conception? Yes, you could go back on the oral contraceptive pill, but have you thought about the consequences of doing so? The synthetic hormones used in hormonal birth control may interfere with your ability to breastfeed; and even worse, pose a risk to your beautiful new child’s long-term health (synthetic hormones and other chemicals are passed onto baby directly through your breast milk). You could use condoms instead, but why would you need to, if instead, you could learn an evidence-based method of tracking your fertility to ascertain with certainty whether you are ovulating or not? For many women, who are fully breastfeeding, ovulation does not occur during the first six-months after giving birth. If you’re not ovulating, you can’t get pregnant! 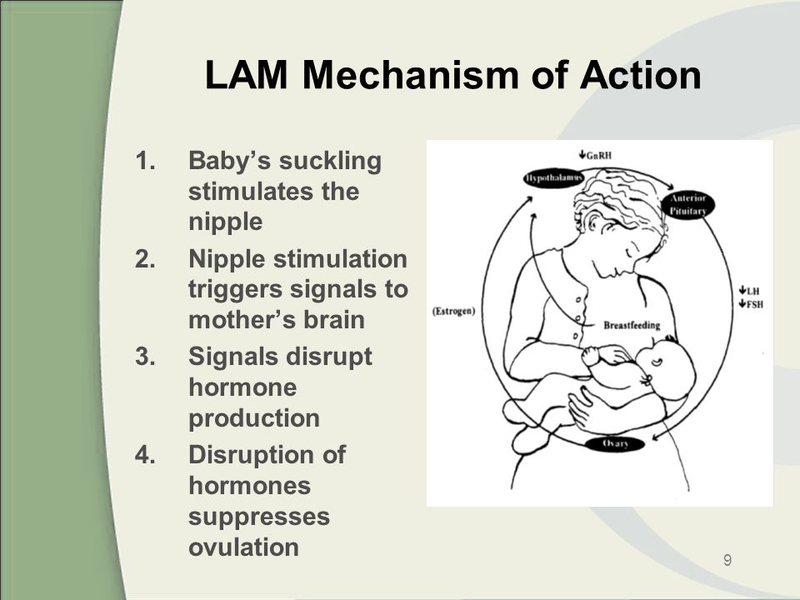 And this is where the highly effective Lactational Amenorrhea Method (LAM) can be an incredibly useful tool. Producing milk for breastfeeding is called ‘lactating’; and not having a period is called ‘amenorrhea’. So, this method of birth control is called Lactational Amenorrhea (or LAM). Breastfeeding isn’t just a healthy way to feed your baby. It can also be a safe, natural form of birth control – but only when you follow specific guidelines. If you choose to breastfeed your baby exclusively and do not give baby any supplementary foods in the first six-months after birth, the hormones which trigger your milk supply also suppress production of your reproductive hormones. Low oestrogen and progesterone levels prevent ovulation from occurring and this means you can’t get pregnant. In other words, exclusive breastfeeding can delay your return to fertility. Is LAM right for me? You have not experienced a period since childbirth (experiencing lochia – bleeding for up to 8-weeks after childbirth is not considered a menstrual bleed). IMPORTANT: If you don’t meet the LAM criteria but still wish to prevent pregnancy naturally then I can teach you the Partial Breastfeeding Method to help you determine your return to fertility; or the Sympto-Thermal Method to prevent pregnancy naturally once your fertility has returned.